Entry filed under: Dog Stuff, From Under The Desk. Tags: Ami Simms, Dog Stuff, Madison. Madison you are such a good dog. Ami I loved the video. Well…I am a cat and my name is Jack and I know how to get treats as well. Just shake the can and I come running. Of course, if I want them NOW..I just get on the back of mom’s desk chair while she tries to work and I “pat” her head with my paws…hard. She gets the idea. By the way, this is not easy as the chair swivels!! My mouth actually started watering with their anticipation. How pavlovian is that? I love your blog, thanks for sharing. When are you going to be in the Phila/NJ area? I’d love to teach for you. All you need to do is ask! I am just checking to make sure you know that peanuts should not be given to dogs. If they lodge in the windpipe immediate surgery is needed to save the animal. You can check with the humane society on this and a list of human food that can harm your dog, like chocolate, grapes, raisins, avocado, etc. or I can send you the list. Madison you are so good. Can’t wait for you to publish your own book! All we can say, Madison, is that the life of a dogs is great. You certainly have things figured out. We wanted to share with you something we have figured out about food. (and you do know how important eating is!!!!!!) Our Dad is “the” feeder and he used to feed us in the evening (morning, too…..) when he came home from work at 5:00. Well, he doesn’t work anymore. He retired. (does that mean he’s too tired to go to work, we don’t know) Anyway, we digress….. We know all about time, too, and when “we” get fed. As a team, we started to bug Dad to feed us earlier and guess what? First, we got him to feed us right at 4:30 and he went along with it. We are so good at this that two years later we get now our dinner at 2:35 in the afternoon! It is great! Nose nudges and little barks and being constantly under foot have helped us to achieve this amazing trick. You know, I ‘m not sure Dad can even read a clock so we have certainly have him fooled. On a personal note, Molly has had something called vestibular syndrome. She is getting better after lots of pills and special care but she also lost weight while sick. So, we have both been getting lots of treats! Molly is so very smart! And the video is awesome too! Reading Molly’s e-mails always leaves me with a smile on my face and skip in my walk! Look forward to seeing what she is up to each month! 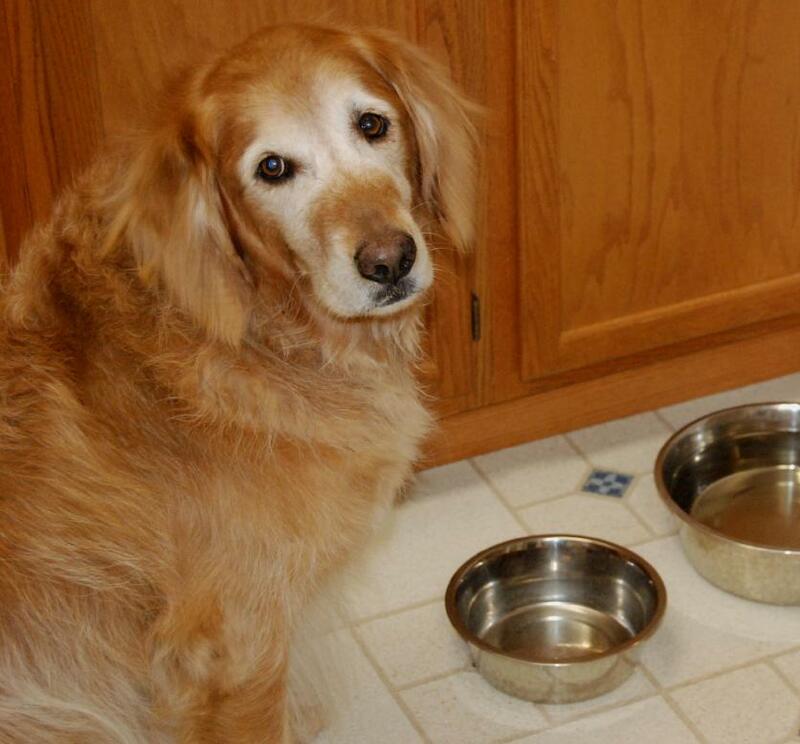 Remember Molly…..your owner is never too old to learn! Hi, I’m a cat but I have trained my mom really well. I have my breakfast at 6:45 then I get a treat when she gets home from work and dinner at 6 pm. At 8 o’clock I get my evening treat and if I spend some time on mom’s lap, I’ll get more. She was kind of slow learning the schedule but she has it down now. What a good and smart dog; thanks, Madison, for making my day! Thank you so much for sharing your life with us; you truly have a gift for writing. Have you ever thought about writing a book of your exploits? I bet it would be a best seller!!!! 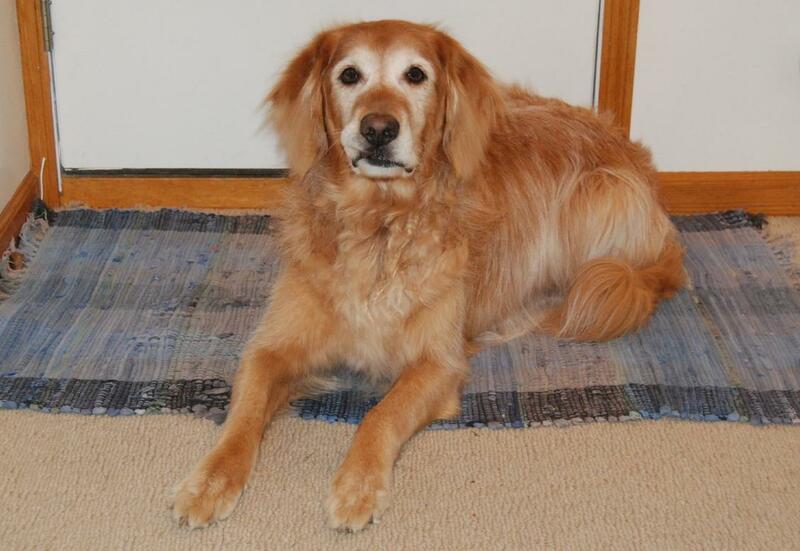 Madison, I love the picture of the little “sneer” on your face when you are told”To the rug.” Guess that look says it all. Madison, we have our parents trained very well, too. Every morning after our mom takes her pills, we run into the kitchen to get our mini hotdogs and hip pills (it’s really glu-co something for our joints). I trained mom early with the mini hotdogs because when I was a pup I had a bad shoulder and the vet told mom to try the glucos-whatever. They didn’t have liver-flavored back then (people don’t have flavored medicine, so sad) so mom would put it in a piece of hot dog. I got better but still waited for the piece of hot dog. Of course, because we were puppies and didn’t understand, my sister also got a piece of hot dog. Now my sister points at the fridge door every morning in case mom forgets where she keeps them. We loved the video. Thanks, Madison! Made mom smile a lot. Wow, Madison, I have been reading your blog my whole life (3 years). I have a great Mom and Dad, lots of treats, a little dashound buddy, and four cats. I really don’t like cats as they are allowed on the sofa and the bed. My favorite treats are those bacon strips in a bag.MMMmm. I am a red dog with a curly tail. The vet says I am a “Mystery ” dog. I think that must be a good thing. Keep up the good work training your owners. Oh Madison, if you were a cat we’d be three peas in a little pod! You really have your Mom well trained. We do too but we are just a little more sly. Shakespeare is the smallest and Mom calls him “the baby” so I send him out to do the deed. He stands about 5 feet from Mom and and gets those real droopy “sad” eyes, turns his head to the side, and then does this pathetic “meow” whisper like he’s starving and doesn’t have the energy to make any noise. He is so good at it that even I believe him! Anyway, we ALWAYS get treats when he does that! You’ll have to come over and see it sometime. It’s worth the price of admission, which is one bag of cat treats! You are such a smart dog, Madison! My parents had a dog named Sambo (well, he used to be my dog, but my dad decided I should get another dog when I got married because HE wanted Sambo!). I taught Sambo lots of tricks, even “dance”, and then my dad taught him the tricks in Swedish! Sambo was a bi-lingual dog–really tri-lingual, as he understood English, Swedish, and, of course, Canine! =) He also knew how to spell Treat, and later he learned how to spell Walk! He was a cockapoo, and they had him for many years. Now they are all in heaven together, along with my other two dogs, Molly and Rex. Molly knew how to spell Treat, also, but Rex was older when we got him, so he mostly was watchdog and aspired to be a lapdog (all 50 pounds of him!). Madison, I think we are clones. Mom always reads to me when you write. Lots of times she laughs and shakes her head too! She really liked the one about how you just sit by the place where the “put away” toy is. I have to find mine for mom all the time. She forgets, but I never do. My Mom got a new refrigerator for me. It shoots ice cubes right out of the door and I get to jump and catch them! Glad spring is here again – pink nose time! I love your blogs Madison! And I can nag my dad too so he feeds me earlier and earlier than the usual 4:00 pm time- I just nudge his hand on the computer and stare up at him with my big brown eyes till he gives in! Bailey –your black Lab blog buddy. Hello, my name is Shasta I am a 2 yr old boxer mastiff mix, I own Eileen. Eileen was worried about the treats ruining my dinner. She loves Good and Plenty licorice candy she gave me one and I LOVE THEM they are fat free and very small, she puts them in my busy cube which takes me alittle time to get that stupid thing tipped so one comes out. I am wondering if maybe I could do some advertising for them???? Don’t worry fame would not go to may head!! I have just read your article although it wasn’t what i was looking for I found it very interesting. It’s me, Snickers, and my sister, Sugar, again. We just wanted to tell you that if you come to Kernersville next week, we not only have an all-day buffet here, but twice a day we have ice cream! Mom buys us plain vanilla so Sugar can take her medicine. Sugar just doesn’t like feeling the pills in her mouth, so she would always eat the snack, then spit out the pills! Mom tried putting it in her food, giving it to her in cheese, or peanut butter, etc., etc., but every time, Sugar would just spit them out. Finally, Mom found that the best thing was a spoonful of ice cream! Even though I don’t have to take any pills – well, except my Heartgard, but we both LOVE those – I get ice cream, too. Usually, we have ice cream at 9 am & pm (that means morning and evening). Sometimes, Mom will be doing something, like typing on the computer, so we have to remind her about the evening ice cream. That’s also when we get our treats. Well, I go into the office & let Mom know that it’s time, and she says, “OK, in a minute.” Well, sometimes those minutes seem really long. So then Sugar will go in and remind her, and if Mom doesn’t pay attention, Sugar takes her nose & pushes the keyboard drawer under the desk. THAT really gets Mom’s attention! Isn’t that clever? Usually, we have either a pig roll, or Bacon (a.k.a. Beggin’ Strips), then we have 2 large Milkbones each. Sometimes, Mom forgets how to count & only give us one Milkbone each. Isn’t that silly? WE know how to count AND tell time! In that case we have to keep reminding her until she goes & gets the second Milkbone. Nope, you can’t fool us! Loved the video, but don’t understand why YOU aren’t in it. I love treats, too. My Mommy gives me one every morning just to get me out of bed. hehehehe!